Walking around Uptown, I spotted this rolling door mural. Sort of mandala-ish looking with lots of eyes and faces staring back at you. As other CDP photogs have shown us, roll up doors are great canvases. Welcome to Monday Mural: if you like murals or have a mural you'd like to post, this meme's for you. Just follow the Linky steps below. You decide what constitutes a mural. Once you start looking, you find them everywhere. Be sure to link back to this blog and visit your fellow posters. Looking forward your mural finds posted this week. Google+ users, please configure your post so we all can leave a comment. Thanks. A recent night view of Lake Merritt looking east. The Necklace of Lights adds magic to the scene. Rise Above is a newish used book shop and record store. Additionally, they also provide free food to local residents in need. The floating building in the recently completed mural is an accurate representation of the store's location and seems to have been done by a multi-person crew. Apparently they are planning a move a couple of blocks down the street. Already? You know it's the holidays when Ken dolls and GI Joes climb onto the Christmas tree. This one is from the archives. This Venice scene adorns the side of an apartment building along the driveway and then around to the back. Way back when, I showed you the back parking area. This view can be spotted from the street. I guess the building's owner is an aficionado of La Serenissima. Welcome to Monday Mural: if you like murals or have a mural you'd like to post, this meme's for you. Just follow the Linky steps below. You decide what constitutes a mural. Once you start looking, you find them everywhere. Be sure to link back to this blog and visit your fellow posters. Looking forward your mural finds posted this week. I apologize for not commenting last week; time just got away from me. Google+ users, please configure your post so we all can leave a comment. This lovely bird is on an Uptown wall of a restaurant terrace. Since the restaurant was closed, I couldn't get an unobstructed shot. I'm guessing it's by Doty but can't be sure. If I'm wrong, someone will set me straight. Welcome to Monday Mural: if you like murals or have a mural you'd like to post, this meme's for you. Just follow the Linky steps below. You decide what constitutes a mural. Once you start looking, you find them everywhere. Be sure to link back to this blog and visit your fellow posters. Looking forward your mural finds posted this week. Spotted this vignette while walking along College Avenue. Oakland rouge? 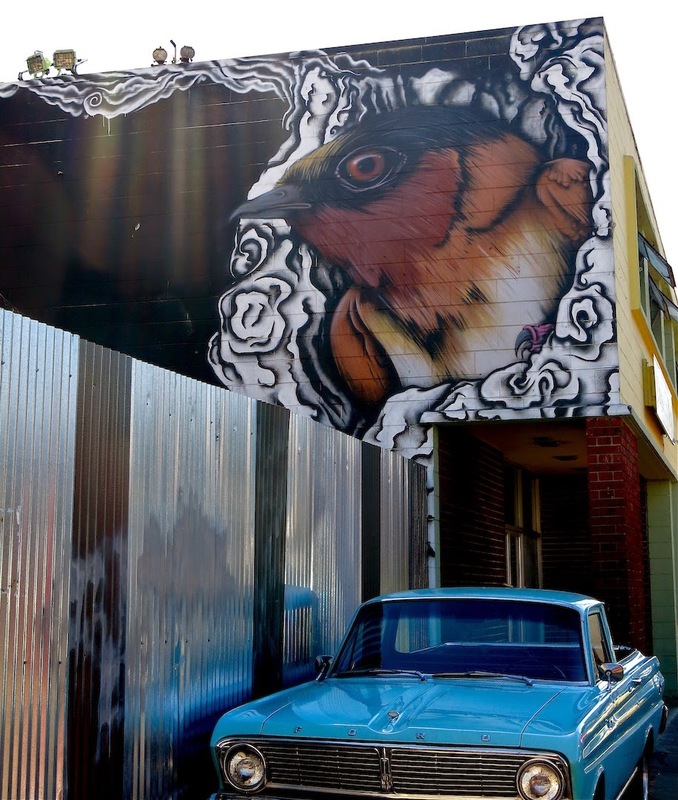 This wonderful avian portrait is found in the Uptown area just off Telegraph Avenue. If it were a real bird I'd worry about the paint job on the Ford. 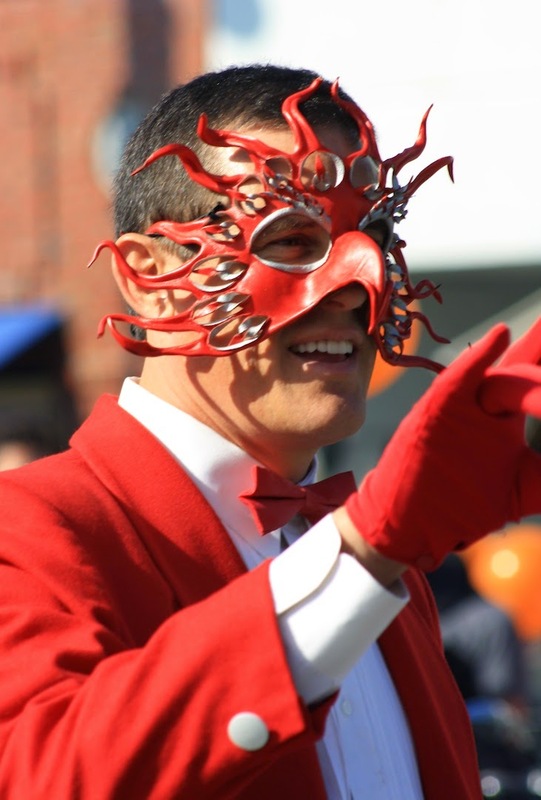 These shots are from the annual Piedmont Avenue Halloween Parade. 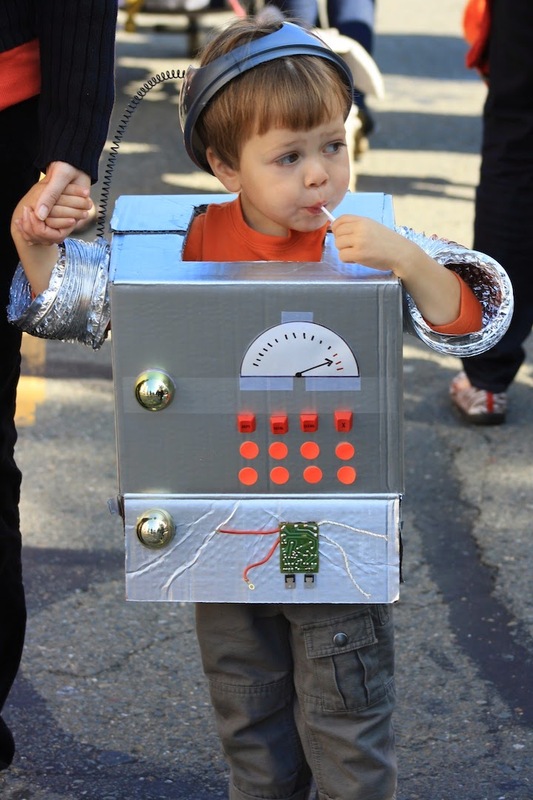 The street is closed off for several blocks, there's a costume parade in the middle of the street, and local businesses become trick or treat stations that give away candy. Even the adults get into the spirit. I'll be out of town for a few weeks and won't be able to leave comments. 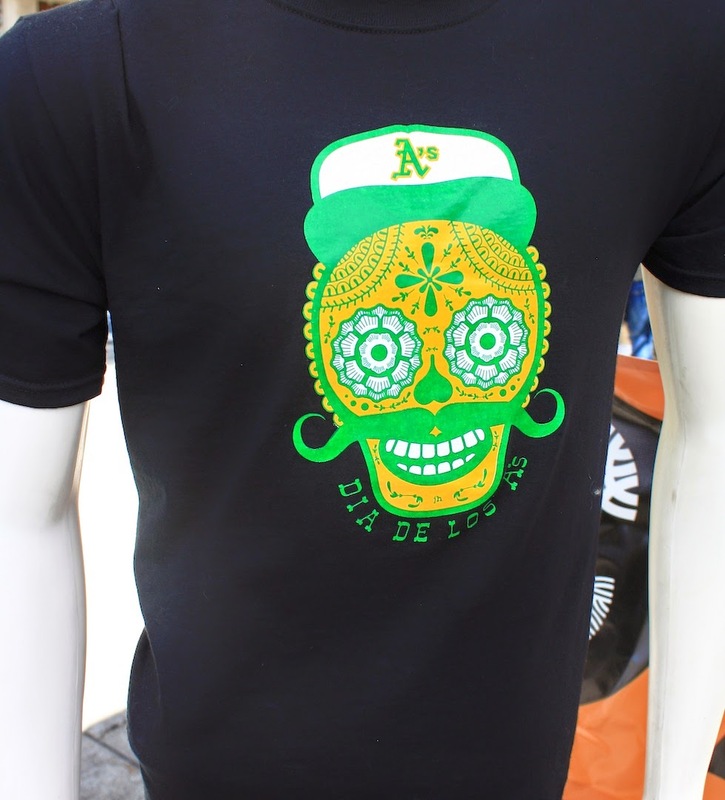 Day of the Dead is a big deal in Oakland. 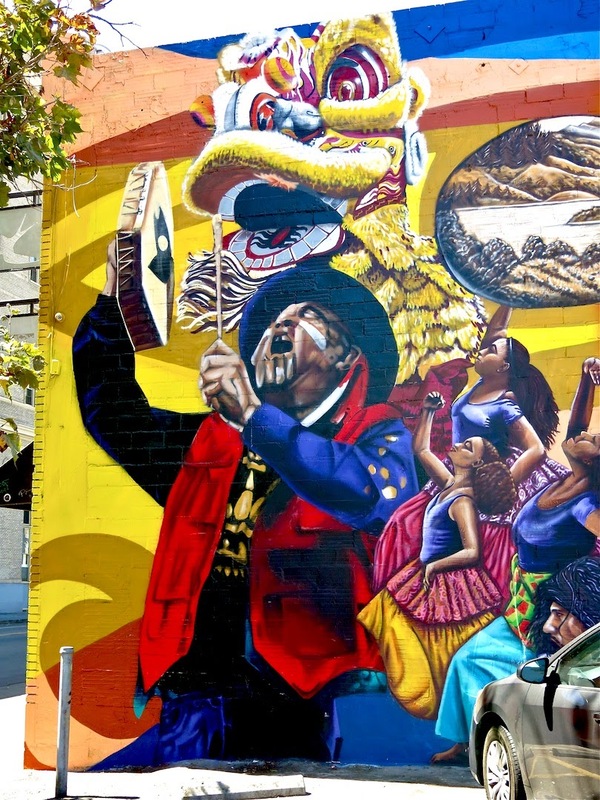 There's a big street festival in the Fruitvale District and the Oakland Museum sponsors an annual exhibit usually featuring altars created by local artists. This small wood assemblage was in the Museum gift shop. But you can find nods to the day everywhere around town. Like at this summer street fair. There's a similar logo for the Giants too. But that's the other side of the Bay. I'll be out of town for a few weeks, so I won't be able to leave comments. Sorry. Dewey Tucker was a jazz guitarist who died in 2010, a victim of mistaken identity by gang members. 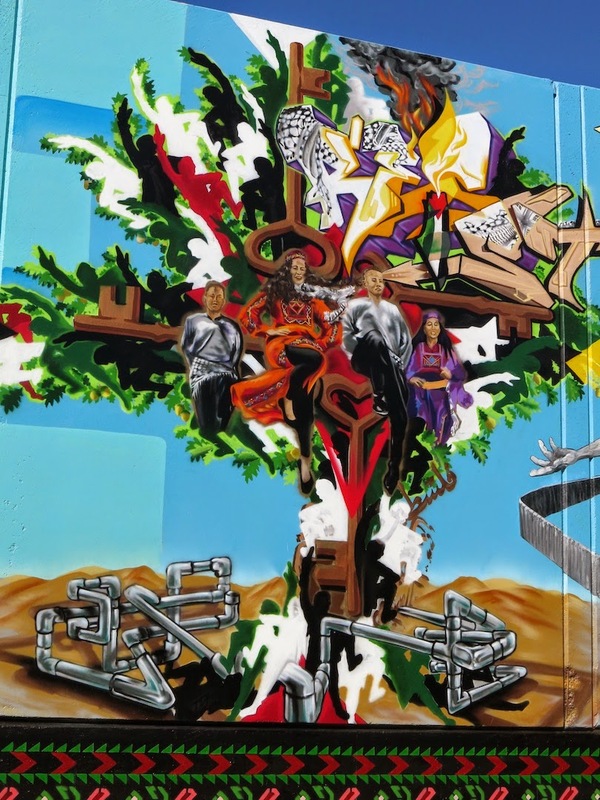 This mural was done by the Community Rejuvenation Project. His killers were tried and convicted earlier this year. I will be gone for three weeks or so, but the meme will continue to go up on Sundays at 7PM PST. Sorry, but I'll unlikely be able to leave comments. There are four massive bronze sculptures by Mario Chiodo in this Uptown park that highlight moral and social leaders of the world. It's really hard to take a picture of them to capture size, color, and detail. These are the best of a bad lot. Interestingly, there are images 360 degrees around each piece. Here's another section from the Alice Street mural, first shown last week. More of Oakland's diversity is celebrated. The Tribune Tavern is in the old Tribune Tower, former home of the local newspaper. It is one of many new restaurants that have opened up in the downtown and Uptown areas. Oakland has become quite the restaurant scene, with even San Francisco chefs coming across the Bay to open a new venture. I like that in good weather, the windows slide back and voila! you're dining al fresco. On October 17, 1989 a 7.0 earthquake struck the Bay Area. While most of the country remembers how it disrupted the World Series and closed the Bay Bridge, locals remember the destruction of the Cypress Structure. The Cypress was a double deck freeway section running through West Oakland physically dividing the community and bringing incessant noise and chemical pollution. It was a poor and industrial neighborhood that got little attention or support. 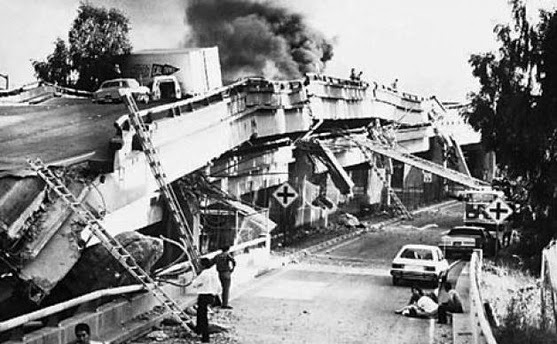 The earthquake caused the freeway to collapse, ultimately killing 42 people. This simple sculpture, standing on the parkway that replaced the freeway, memorializes that event. The first responders were neighbors who ran out with every manner of ladder cobbling together scaffolds trying to reach people trapped in their cars. The air was thick with concrete dust that impeded both light and breathing. Their bravery and selflessness were incredible. After much debate and community resistance to a new freeway, it was decided to replace the freeway with a parkway. So many years later the Mandela Parkway seems a graceful stretch of open sky, sun, and green. The park that runs down the center of the street goes for several blocks covering the distance of the old freeway. The day I was there people were driving, walking, biking, and skateboarding down the street and the pathway had runners and bench sitters enjoying the sunny weather. The community is still poor but now it feels like it's on the upswing. It was a hot day and the shade looked so inviting. Nothing like a little nap to recharge the batteries. Linked to ABC Wednesday. This vast mural on Alice Street is across from the Malonga Center for the Arts. Part of the city Parks and Recreation Department, the center offers classes and a performance stage for performing and visual arts. While I was snapping this mural an African drumming class was practicing and filled the surrounding streets with an exciting beat. The mural is by Desi and Peskador of the Community Rejuvenation Project. This new mural in the downtown area was completed by Lord Nychos the Weird, a street art group from Vienna. As near as I can tell Nychos is the primary artist and Lord and the Weird are crews that work with him. He's done walls all over Europe, South America, and several places in the USA. It's hard to know what to say about a gigantic dissected rabbit. There are things about this work I admire, but the creepiness factor is a little too high for my taste. This wall of advertising announces a new business coming to Broadway. It's going to be a square block of shopping, living, social gathering, and art spaces all in one complex to be called Hive. Sounds like the perfect name. It's the first of the month again, and the City Daily Photo theme is Movement. Here are a couple of happy little guys at last month's Chinatown Street Fair. They were ecstatic and wanted to go down again. Mom said no. Linked to CDP Theme Day. This downtown parking lot wall was painted last year by Mr Never Satisfied. 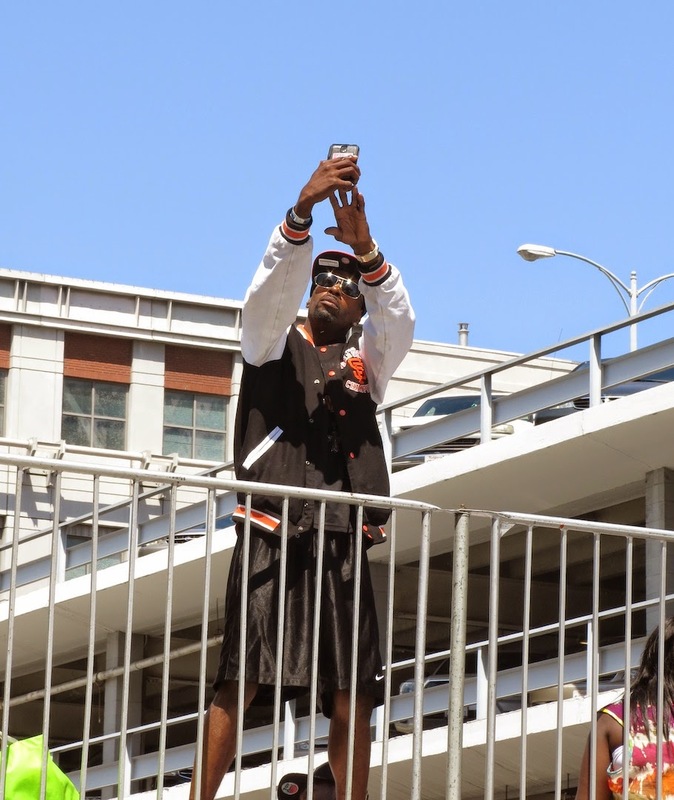 It was apparently sponsored by the LeQuiVive gallery which represents many of the well known street artists in Oakland. I have no idea what it means but Mr. Owl appears to have serious self-esteem issues. The little section at the lower right is a small offering by Irot who did the wonderful Indian chief portrait shown a few weeks ago. Too bad it wouldn't fully fit into the photo. Arrowhead Marsh is so named due to the shape made by the marsh grasses. It's always soothing to walk the shoreline of ML King Shoreline Park. Found these near the lake. There's got to be a story behind this vignette. Any ideas? 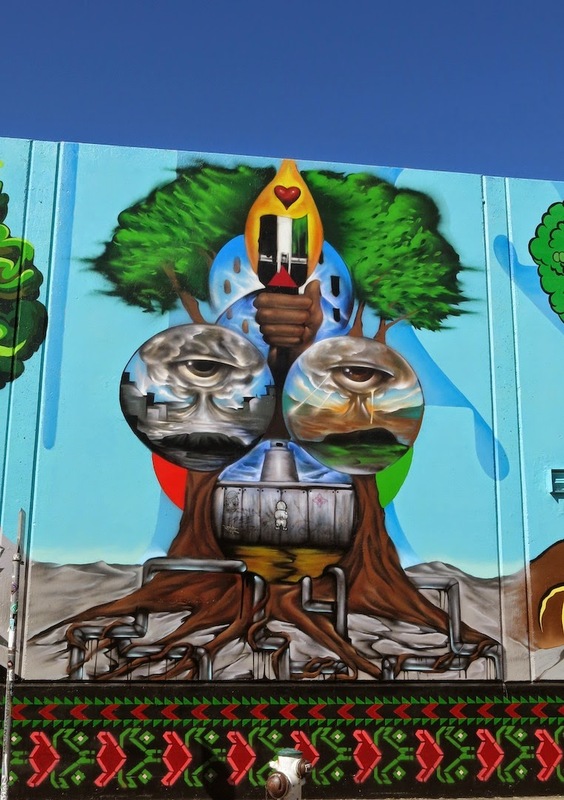 The official name of this mural is Oakland Palestine Solidarity Mural. Painted by 13 artists, it was finished and dedicated at the end of August. As you can see, it is quite massive so I've added a couple of shots showing greater detail. I happened to run across this mural as it was being completed. To my surprise no one was using aerosol cans, but instead were using brushes. The styles vary from panel to panel with each image being quite detailed. 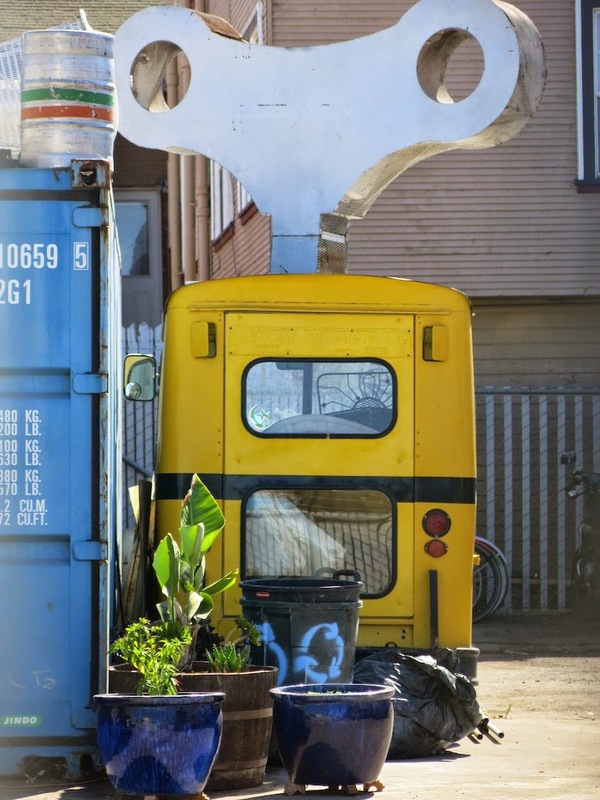 This life size wind-up bus was photographed behind a fence in West Oakland. It looks like a project that needs protecting. These two seasoned performers tore up the blues stage at this summer's Art and Soul Festival. The joint was jumping. Linked to ABC Wednesday. I was driving up West Grand Avenue and found this highly decorative mural near the freeway on ramp. 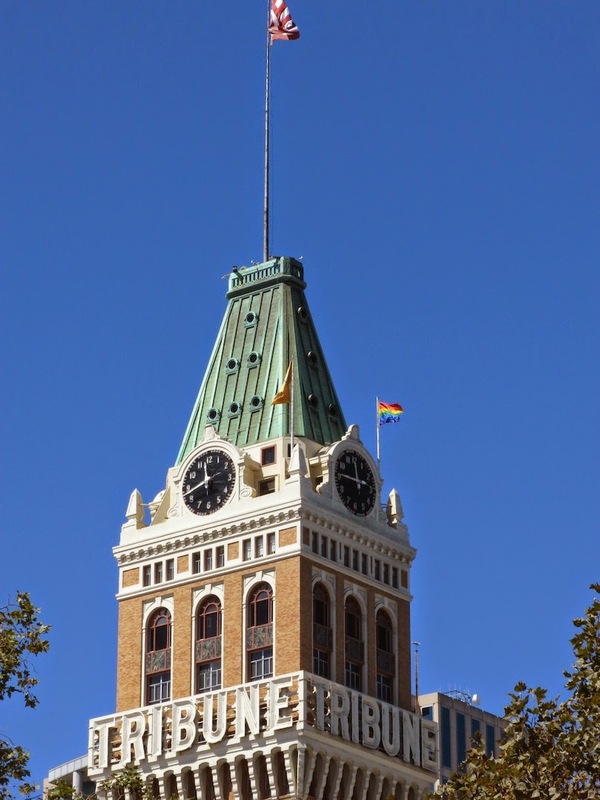 It's by local artist Oliver Black and decorates the Blüm Oakland building. What's that you ask? I wondered too. So I walked across the street to get a better idea. First I admired the mural and its wonderful detail with an arts & crafts flair in the use of dark outlines. Then I noticed the security guard. Hmmm. Then I smelled the distinctive sweet aroma of cannabis. Oh. It's a marijuana clinic. That explains the razor wire along the top of the fence. Who knew? Snapped on Mandela Parkway in West Oakland. He rode confidently and wasn't thrown off balance by the cardboard container he carried. I'd end up on the ground with head trauma. 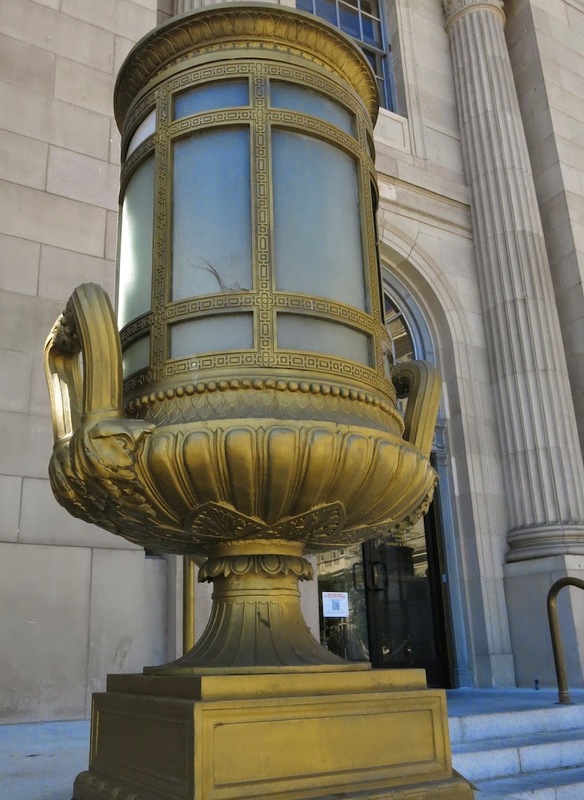 One of the stately lighted urns that flank the entrances to the main post office downtown. Most dogs would not put up with being costumed. But this mellow dog at Oakland Pride didn't seem to mind or worry about what the other dogs were thinking. Linked to ABC Wednesday. There's a new mural in West Oakland by the TDK crew. (Thanks to Sage for tipping me off). It covers a block long building belonging to the West Coast Ship Supply and wraps around to the back part of the building. I videoed the length of it but it is so laughingly jumpy I won't post it. Yet another learning curve to climb. Below are a few more shots of the wall. It was a fine day to walk around Lake Merritt. The pelican chorus line was in fine form as they paddled around the southern shore. In the background is the county superior court building. It's called deco but to me it looks like post-war Stalinist. The skies are blue but the light is changing just like the seasons.